Pierre-Henri de Valenciennes, a French painter, was born Dec. 6, 1750. Valenciennes was one of the founders of French landscape painting, and it is often said that Valenciennes was to landscape painting in France what Jacques-Louis David was to history painting. In point of fact, Valenciennes invented a new kind of landscape painting, the historical landscape. One Valenciennes painting, in the Louvre (second image), shows Agrigento in southwestern Sicily—not the modern city, but the ancient one, Agrigentum, fought over by Romans, Greeks, and Carthaginians. It was also the home of Empedocles, the father of the four-element theory of matter. That is probably not enough to pull this painting within the rubric of the history of science, but two other paintings by Valencinnes depict well-known events in the history of science and allow him to qualify, for today, as our scientist of the day. The first of these paintings is usually called Cicero Finding the Tomb of Archimedes (1787; third image). Cicero, newly appointed questor to western Sicily in 75 BCE, had attempted to find the grave of Archimedes, who had died 137 years earlier in the siege of Syracuse. None of the locals could tell him where Archimedes was buried, but Cicero knew that Archimedes had asked that his tombstone bear an image of a sphere inscribed in a cylinder, to commemorate his greatest discovery, that the ratio of the volume of a cylinder to that of its inscribed sphere is 3/2. Cicero went in search of a gravestone carved with that image and found it, and Valenciennes’ painting captured that moment of discovery. It is a good thing he did, because Archimedes’ tomb has not been seen since. The painting is in the Musée des Augustins, Toulouse. Twenty-six years later, Valenciennes painted the Eruption of Vesuvius (1813; first image). 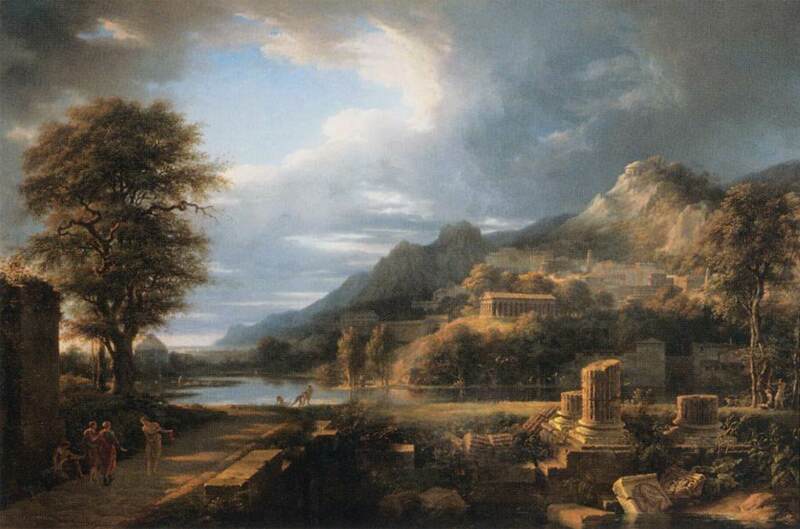 Vesuvius had erupted quite spectacularly several times during Valenciennes’ lifetime, but the eruption he depicted was not any recent event, but rather the historical eruption of 79 CE, which buried the cities of Pompeii and Herculaneum. It also cost the life of the eminent Roman natural historian, Pliny the Elder. Indeed, Valenciennes’ painting is often called The Death of Pliny, because if you look closely, you will see Pliny expiring on the shore of the Bay of Naples. This painting is also in Toulouse. Given the success of these two paintings, it is a shame that there have been very few other attempts by serious painters to depict significant events in the history of science. We have David’s Death of Socrates (1787), and a handful of mediocre 19th-century Italian paintings of Galileo and his encounter with the Inquisition, but that is about it. Wouldn’t it be nice to have real works of art depicting, say, Kepler meeting Tycho Brahe in Prague, or Newton presiding over the proceedings that declared him, and not Leibniz, the true inventor of calculus.